It had to happen. A firm in Essex is filling the gap in the market for worried parents of inner-city school kids who face the daily threat of being stabbed to death between lunch in the playground and afternoon geography lessons. As the Sun reports, the company is marketing school uniform jumpers with built-in Kevlar stab protection. We knew that crime was bad, but this just seems excessive. But as we’ve said before, crime figures may lie, but market demand doesn’t. 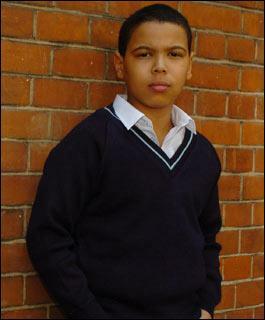 Stabbings in schools have increased and it is well documented that more young people are carrying knives. This is all in the context of violence in classrooms, a pitiful police presence in most schools, and declining trust in the authorities to impose sanctions and enfore discipline. "...That means that the total number of young boys and men carrying knives (5 per cent of half the total population - 5,865,025) is 293,251; the total number of "Frequent Offenders" (7 per cent of 11.73 million) is 821,103, and even worse, the total number of what the Home Office categorises as “Frequent Serious Offenders” – 1 per cent of 11.73 million - is equal to 117,300." With these figures showing the extent of the problem, is it any wonder that a market response has occurred? With roughly 3,000 secondary schools in England and Wales, that puts a generous spattering of knife-wielding, kiddy criminals in most playgrounds across the country. No wonder parents are scared. One practical reason why knives are such a problem is because they are so easy to conceal, require no instruction to use, and they don’t allow the victim to put distance between themselves and the knife-wielding yob. Unfortunately, police officers know that stab-vests provide only limited protection to the main strike zones of the body, and even then with enough force Kevlar can yield to a sharpened butter knife. It is meant to prevent deep puncture wounds from knives wielded in clumsy scraps when the attacker is going to be slashing about. Exactly the sort of altercation that happens between 14-year-olds at a bus stop. The moment we learn (and it will happen...) that just one of these stab vests has saved a student’s life, you can be guaranteed that sales will soar. Until then, what will be the response to this market innovation? Lots of mums going to kit their sons out with stab vests in a bizarre arms race until all kids in comprehensives have them? (and then will we have to pay to subsidise stab vests for poor families who can’t afford them?). Will the gangs then go one better and arm themselves (more routinely) with shooters to trump the stab vests at six yards? Are knives now such a fact of life in our cities that the only choice is whether you arm yourself to fight back (deterrence doctrine), or get kitted out to survive an inevitable assault (defence theory)? And what of these parents as humble taxpayers? Can mums who choose to fork out for a bit of Kiddy Kevlar, expect a refund on their council tax for a share of their police precept? This sort of development means we really aren’t that far from syndicates of worried parents forming their own security groups with hired protection to keep their kids safe on the way home from school. We know private security is booming, and that sort of opt-out from the failing public service of our criminal justice system would be the next logical development. And it would of course be condemned by all “reasonable” people and Sir Ian Blair. A new Home Office survey of crime among young people, released yesterday, received too little attention in the press (with the exception of the Telegraph) especially given what it revealed about the sheer scale of criminality among adolescents in Britain today. Reports of the survey carried the headline figure that one in four youths aged 10-25 admitted to committing a crime in the previous 12 months. 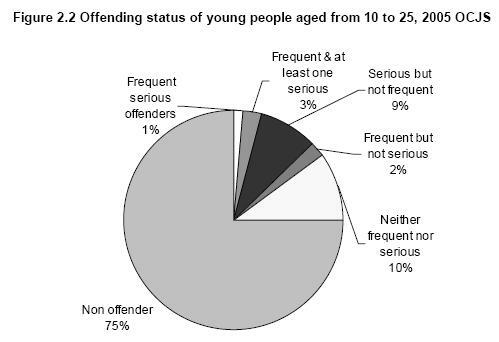 Three-quarters (75 per cent) of young people had not offended in the last 12 months. Of the 25 per cent that committed at least one of the offences in the last 12 months, many had offended only occasionally or committed relatively trivial offences. The most commonly reported offence categories were assault (committed by 16 per cent) and other thefts (11 per cent). Criminal damage, drug selling offences and vehicle-related thefts were less common and burglary and robbery were relatively rare at one per cent or less. Males were more likely to have offended in the last 12 months than females (30 per cent compared to 21 per cent respectively). For males the prevalence of offending peaked among 16- to 19-year-olds, whilst for females the prevalence peaked earlier at age 14 to 15. Seven per cent of all young people were classified as frequent offenders, i.e. they had committed an offence six or more times in the last 12 months. This group was responsible for the vast majority (83 per cent) of all offences measured in the survey. Thirteen per cent of all 10- to 25-year-olds had committed at least one of the serious offences measured. The majority (71 per cent) of serious offenders had committed an assault resulting in injury and no other serious offence. One per cent of all 10- to 25-year-olds had frequently committed serious offences (i.e. committed serious offences six or more time in the last 12 months) and were classified as frequent serious offenders. Overall, four per cent of young people had carried a knife in the last 12 months. Males were significantly more likely than females to have carried a knife (5 versus 2 per cent). Now, if you want to know how many people these percentages relate to (quite an obvious extrapolation you would think but the Home Office report doesn't manage it), firstly, we know that the total number of young people in the UK is 11,730,050 (taken from Eurostat - the statistics agency - which gives a 2005 breakdown of the UK population by the age groups referred to. That means that the total number of young boys and men carrying knives (5 per cent of half the total population - 5,865,025) is 293,251; the total number of "Frequent Offenders" (7 per cent of 11.73 million) is 821,103, and even worse, the total number of what the Home Office categorises as “Frequent Serious Offenders” – 1 per cent of 11.73 million - is equal to 117,300. This is utterly damning. A quarter of a million kids carrying knives regularly in public. More than three quarters of a million frequently committing crime - at least once every 8 weeks. And most disturbing - the truth about how many serious criminals are out menacing our streets everyday: almost 120,000 young criminals guilty of several or all of the following "serious offences" on a regular basis: car crime, burglary, robbery, theft, assault resulting in injury and selling Class A drugs. When you see figures like these, it is more proof of what is becoming increasingly clear to a majority of people: law and order is on the verge of completely breaking down in Britain. In some of the poorest inner-city areas of London, Nottingham, Glasgow, Liverpool and Manchester it has already happened. Violent crime is out of control because young criminals know the law can't or won’t touch them, and despite the enormous amount we spend on it each year, we taxpayers have long suspected that the criminal justice system is broken and can't keep us safe. A system overwhelmed by the volume of crime and handicapped almost to the point of uselessness by ineffective policing, weak sentencing laws, liberal magistrates, corrupt probation practices, an aggressive penal reform lobby and above all, zero accountability to the millions of crime victims each year who deserve so much better. And to think our criminal justice system - courts, prisons, police and probation - cost each household in the UK more than £1,000 per year. Not so much wasteful spending, as downright ineffective. We have to get real about the problem of crime in Britain and start punishing minor offences seriously, applying sanctions to young criminals instead of excusing their actions, and recognising the vital importance of deterrence in any system of justice (especially when it comes to diverting young people from crime). And we have to do this before huge numbers of young people grow up to become the violent, lawless thugs who destroy so many of our communities.